Polypropylene backing reinforced with continuous glass yarn with stain resistant finish. 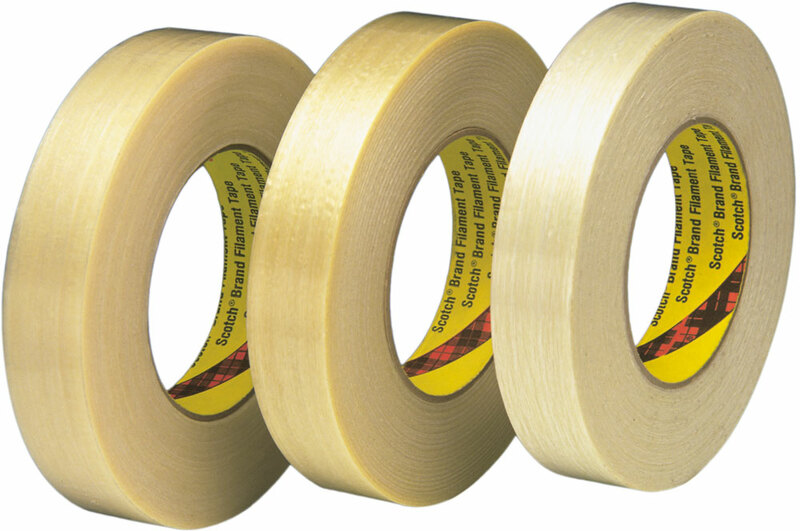 Typical 380 lb/inch width tensile strength with aggressive high shear adhesive for heavy duty closure, reinforcing, and banding. 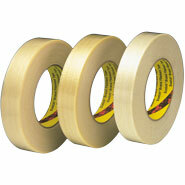 High performance 3M 898 Filament Tape. Polypropylene backing is easy to handle and dispenses and provides excellent resistance to nicks, abrasion, moisture, and scuffing. Specially formulated synthetic rubber resin adhesive bonds with good initial adhesion, high shear strength, and excellent aging on package surfaces. Preferred construction for L-Clip closure and reinforcement of five-panel folder, full overlap, full telescoping, and clamshell corrugated boxes. Use with hand-held manual dispensers, definite length table top dispensers and automatic L-Clip applicators. Can be custom printed using the 3M-Matic™ Print and Seal process.Typical Physical Properties:- Low 3% elongation at break to help keep bundles tight. 70 oz/inch adhesion to steel- Bar codes, type and graphics show through translucent backing.- Standard widths: 6, 9, 12, 15, 18, 24, 36, 48, and 72 mm.